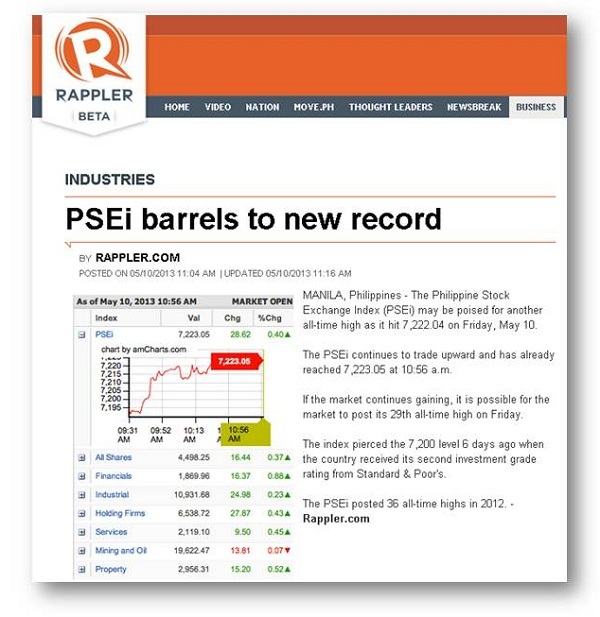 Down here below is another news about Philippines Stock Market this Friday, May 10 2013. It says we hit another record. Congratulation once again. Sana tuloy tuloy lang. We're about in the first half of the year 2013 and yet we already reached the 29th all-time high compare to last year 36 all-time-high records. 8000 here we come! The question is kelan ka sasakay? when are you going to ride in this kind of vehicle. The kind of money vehicle that majority are not familiar with, kaso walang magtuturo sa kanila. 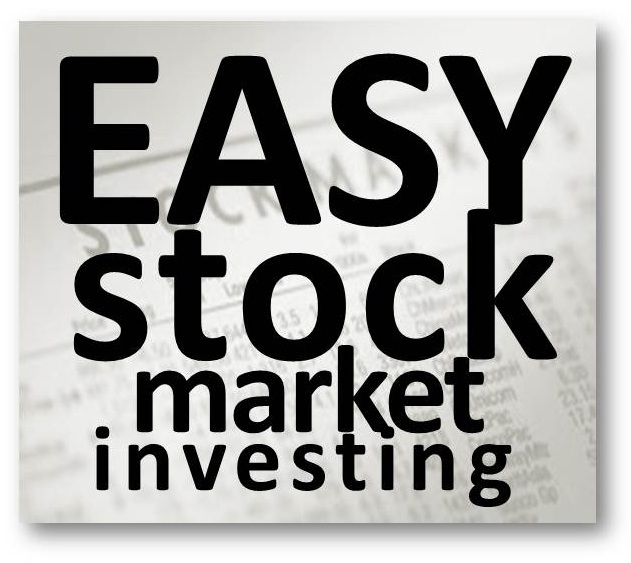 That's the problem and you don't even have friends or relatives that will teach you how to do it, how to invest in the stock market the right way. Your super-rich neighbor will not even waste their time to teach you, because they are busy doing something else. Here's the solution to your problem. 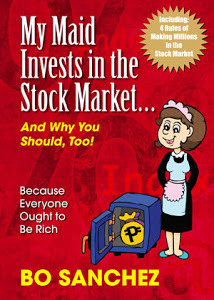 Try Truly Rich Club now and apply the learning you will get from Bro Bo Sanchez and The Truly Rich Club stock market investing experts. MANILA, Philippines - The Philippine Stock Exchange Index (PSEi) may be poised for another all-time high as it hit 7,222.04 on Friday, May 10. The PSEi continues to trade upward and has already reached 7,223.05 at 10:56 a.m. If the market continues gaining, it is possible for the market to post its 29th all-time high on Friday. The index pierced the 7,200 level 6 days ago when the country received its second investment grade rating from Standard & Poor's. Below is a captured snapshot from Bloomberg.com. 7,262.38 as of May 10, 2013. 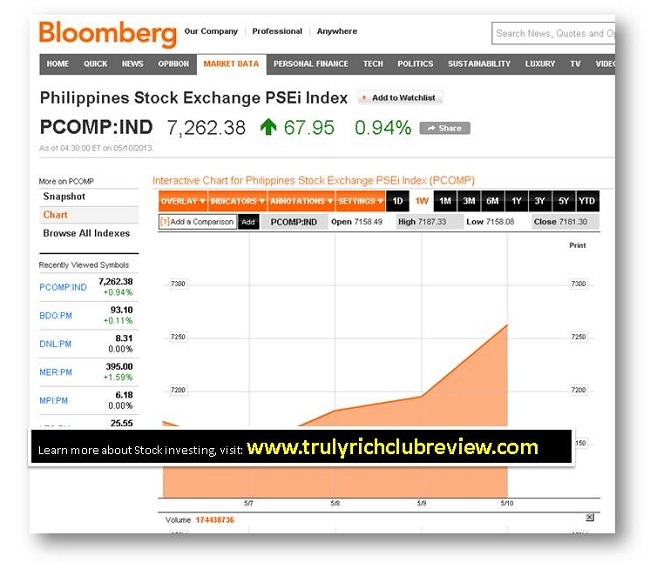 The Philippines stock market 29th all-time high year 2013.